One of the many television screens placed throughout the Capitol building. TVMT provides televised coverage of Montana government, including legislative committee hearings, House and Senate floor sessions, and State of the State. It's a common sight to see legislators, lobbyists, journalists and others watching TVMT in the Capitol. TVMT is also available across the state for Montanans to watch their government in action. In this week’s, Capitol Connections – the topic is TVMT, the service provides statewide, televised coverage of the Montana Legislature and state government. Essentially it is Montana’s C-SPAN. Over the weekend, the Helena Independent Record had a story with the headline: “Senate Passes Bill Allowing State Control of Legislative Coverage.” It was in response to the final approval given to Senate Bill 40 last week in the Montana Senate. Helena Civic Television (HCTV) is the first and current contractor for TVMT. 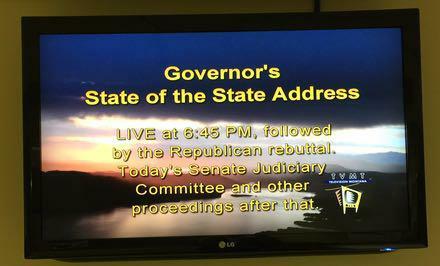 And as a point of disclosure, YPR has – with permission – uses the audio feed from TVMT for its “LIVE” coverage of the Governor’s State of the State address and the response. Guests Senator Jon Sesso and HCTV’s Stephen Maly will talk about why Senate Bill 40 was introduced and what is the future of providing Montanans unfiltered access to watch their government in action. The Capitol Connections theme music is courtesy of the Alex Naumann Trio.